I'm an experienced session musician and music tutor, enthusiastic about teaching. I achieved a distinction for a M(Music) and First Class Honours for a BA in Music, both from Newcastle University. 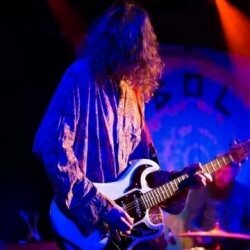 I'm versatile teacher and can teach many styles of popular music, specialising in post-punk, indie, psychedelia, rock, grunge, jazz, and blues. I have an excellent understanding of music theory and can teach both classical and popular theory to a high level. As a professional musician I have performed at national music festivals including Latitude, secret Garden Party, and Green Man, and at prestigious venues such as the Alexandra Palace and the Electric Ballroom. I have recorded with Maverick Sabre and performed with the BBC Concert Orchestra. I have supported Wavves, Focus and the Crazy World of Arthur Brown. I have been a private tutor for four years and have also had additional experience in education as a teaching assistant for Norfolk Adult Education, and an exams invigilator at a Newcastle School. All of my teaching is strongly grounded in composition and improvisation, encouraging students to become the players and performers they want to be. I am directed by the students, teaching what they want to learn, I believe that the best way to learn and succeed is when a student sets their own goals.